What is Community composting and why is it important? Community composting involves a community getting together to establish a composting operation at village level. Community composting keeps green waste local, making it into useful soil conditioner for the community to use. Because Lochaber has a low population density spread over a large, sometimes remote geographical location, it makes sense to collect and process organic waste at local hubs. The collection of organic waste is the one area where Lochaber has an advantage. Most villages have available space to set aside an area for community composting, avoiding pollution from landfill and transport, and saving costs. Community composting can supplement home composting. While home compost bins can take kitchen scraps and some small amounts of garden clippings, a community site can handle the larger volumes of garden material (only) that are difficult to deal with at home. 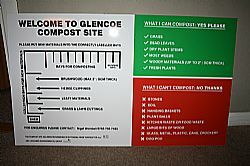 Lochaber Environmental Group coordinates four community compost sites in Lochaber at Acharacle, Glencoe, and Kinlochleven. You’ll more information and advice about community composting on the excellent Devon Community Compost Network website. All the sites were established by LEG, with Kinlochleven being the first in 1999. Glencoe was started in 2005 and Acharacle in 2008. Individual sites are provided with basic tools and share the use of a chipper to deal with bulkier material. LEG has an insurance policy covering all sites and holds an exemption from waste management licensing through SEPA. LEG receive a small grant from The Highland Council for diverting this material from going to landfill. These payments are used to pay for a worker to maintain and run the sites for a few hours each month.